Most of the website they are using this pop out slide for their contact details and for contact forms and other information purpose. 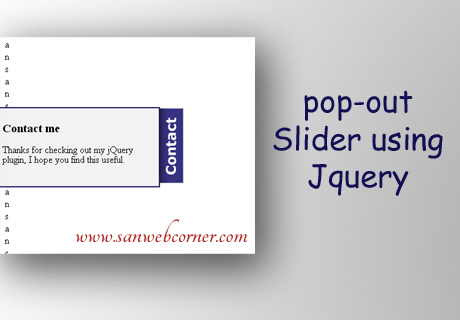 This is one of the good idea to give the contact information in the slide. It will display the message on click the button and hide the information again to click the same button. The below script allows you to change the tab image according to your choice and set the height and width of the slide, and also you can change the tab location like left or right or top or bottom of the page, then you can change popout slider speed also. And you can set slide out when page load using onLoadSlideOut:true and if you don't want to pop out on page load then you can change onLoadSlideOut:false.